We cannot ship to a transfer company like "TENSO.com". 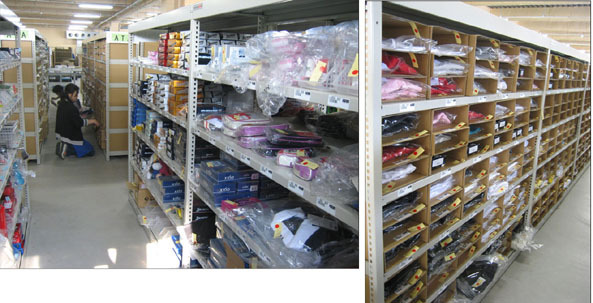 Because we cannot ship to the shipping address that is different from the orderer address. Thank you for your understanding. The method of payment is changed to paypal or it becomes a cancellation. Please acknowledge it. 2:The country of the sending out destination is different from the orderer. 3:The nominee of the credit card is different from the orderer. 4:The card registration country and the country of the sending out destination are different. From April 2017, customs fee will be charged, if your order total amount is over 200,000JPY. Customs fee is 2,800JPY each packing. 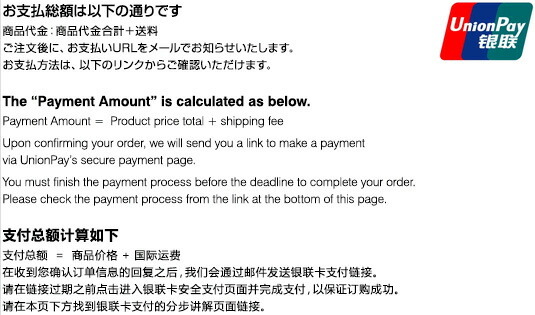 We appreciate your understanding that we will charge 2,800JPY of customs fee. There are prohibited goods in the country of the sending out destination respectively. It is not likely to be able to send it out even if it orders according to the commodity. Please note it. Please read these terms and conditions/shopping guide thoroughly before making a purchase.